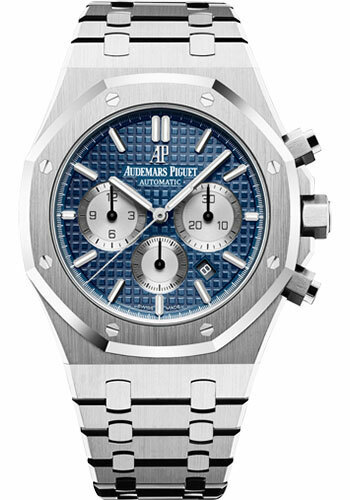 41 mm stainless steel case, 11 mm thick, screw-locked crown, glareproofed sapphire crystal, blue dial with Grande Tapisserie” pattern, rhodium-toned counters, white gold applied hour-markers and Royal Oak hands with luminescent coating, Calibre 2385 selfwinding movement with chronograph, hours, minutes, small seconds, date, approximately 40 hours of power reserve, stainless steel bracelet, AP folding buckle. Water resistant to 50 meters. 41mm stainless steel case, 11mm thick, screw-locked crown, glareproofed sapphire crystal, black dial with "Grande Tapisserie" pattern, silver-toned counters, white gold applied hour-markers and Royal Oak hands with luminescent coating, Calibre 2385 self-winding movement with chronograph, hours, minutes, small seconds, date, approximately 40 hours of power reserve, stainless steel bracelet, AP folding buckle. Water resistant to 50 meters. 41mm stainless steel case, 11mm thick, screw-locked crown, glareproofed sapphire crystal, silver-toned dial with "Grande Tapisserie" pattern, black counters and extern zone, white gold applied hour-markers and Royal Oak hands with luminescent coating, Calibre 2385 self-winding movement with chronograph, hours, minutes, small seconds, date, approximately 40 hours of power reserve, stainless steel bracelet, AP folding buckle. Water resistant to 50 meters.